Perhaps you've seen wedge placemats and wondered about their unusual shape. These functional pieces aren't shaped differently just for the sake of decoration, although the cut does make them quite unique. These wedge-shaped placemats have a very specific purpose. Softly curved at the base and wider at the base than the top, this distinctively designed, wedge-shaped placemat is ideal for round tables. Also known as curved wedges or fan placemats due to this unique shape, these placemats are designed so that the edges won't overlap with neighboring mats on the table. They are also not as large as basic rectangular placemats. Adding a set of theses placemats to a round table can contribute to a crisp, elegant look, particularly when paired with a matching round centerpiece. In addition to being perfect for round tables, curved placemats are also ideal to place at the ends of oval tables. It is important to choose placemats that fit just right and negotiate the curves instead of overlapping the edges. Beyond the aesthetic appearance, wedge placemats are highly functional. These useful accessories protect the table from watermarks, food and other debris that might accumulate during mealtime. Just as with basic rectangular placemats, wedge placemats are sold in a variety of colors, patterns and fabrics. No matter what type of kitchen décor you favor for your eating area, you're practically guaranteed to find a placemat that works for you. From country plaid to elegant lace, there are plenty of placemats available to suit a specific style. Even if you're very particular about the design of your wedge placemats, you can count on finding one that meets your needs. You may find it at a specialty retailer, or you may have to pay a visit to a custom design company that carries curved placemats. Many of these companies offer a range of fabrics from which to choose, or you may have a specific idea in mind that they can bring to life. 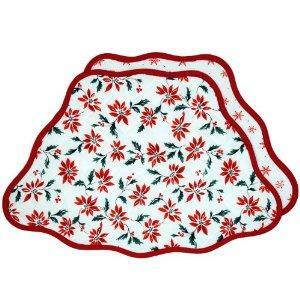 A Well Dressed Kitchen is one of the retailers that offers a variety of custom made wedge placemats. Since their placemats are reversible, they offer a choice of fabric for both sides. In addition to patterns and colors of your choice, it's important to seek out features that function well in your home. Some wedge placemats are constructed of vinyl, while others are made of cotton for a more elegant look. If you have children in the house or simply want to ensure that your placemats are always clean, you might opt for the former; vinyl is easy to wipe clean with warm, soapy water. More decorative versions, however, are ideal for adult dinner parties, social gatherings, or simply to add a dressy touch to the room. If you're hosting a party or other special event and want your dining area to look its finest, you might consider a coordinated setting. You'll find that the great majority of curved placemats are available in sets, complete with a center mat. In addition to this, you can place a decorative arrangement on the center placement. Often, matching cloth napkins are also available. When all of the right pieces come together and your table is protected with placemats that fit properly, you can count on achieving a memorable look for your dining area every time.